Timepieces that are interesting but not always good-looking. Phillips’ upcoming watch auction in Geneva is a 237-lot affair, dominated by the extraordinary, the rare, and the multi-million dollar, but still routine timepieces from Rolex and Patek Philippe. Such watches are rightly regarded as important and collectible, but not necessarily for everyone’s taste or budget. Fortunately for everyone else there is everything else, or about the remaining 40% or so of the offerings that are neither Rolex nor Patek Philippe. Arguably the most interesting is the lot 62, an oversized Zenith ref. 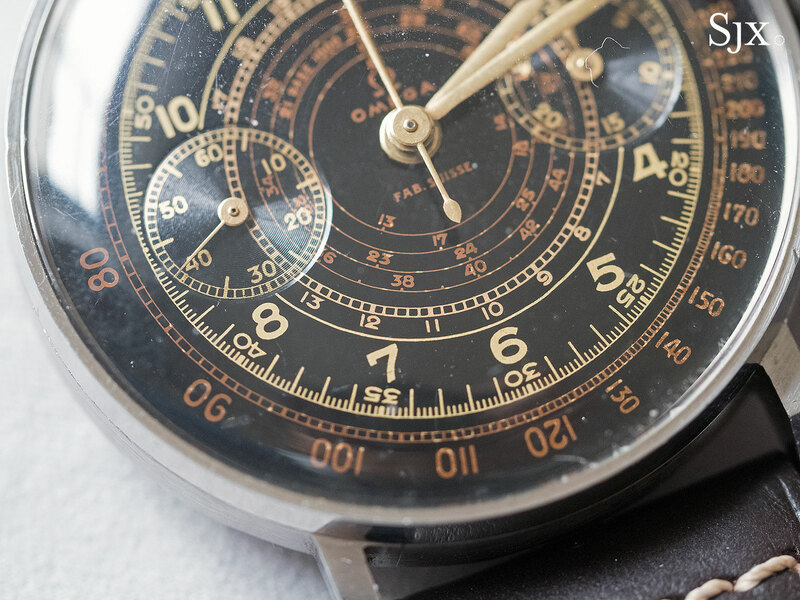 4528 chronograph made for the Italian navy (pictured above), which is not as well known as the Zenith A. Cairelli chronographs made for the Italian air force four decades later but definitely more unusual. 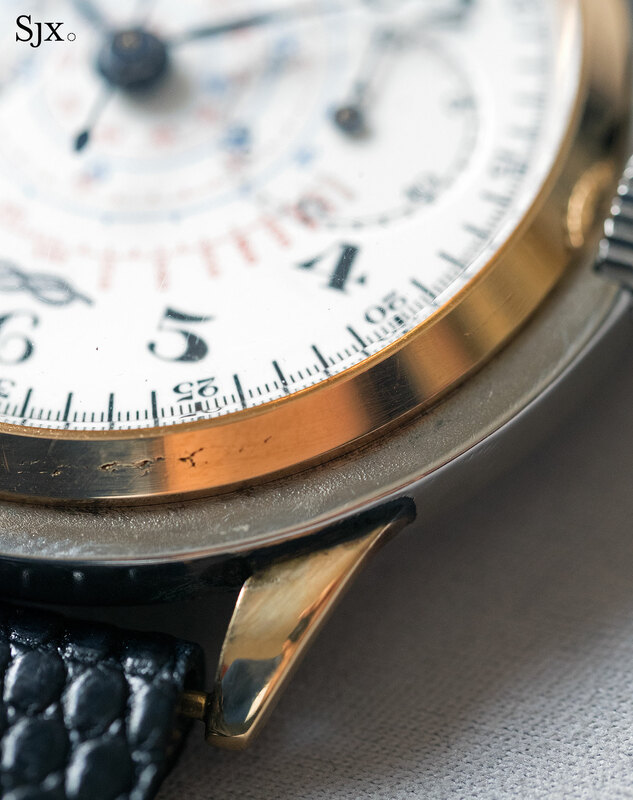 Dating to the 1930s, the watch is one of a series of similar chronographs (other makers include Universal Geneve) produced for the country’s naval forces during that decade. This watch is huge, peculiar, and not conventionally handsome. The case is an enormous 42mm, larger than even a Rolex Submariner, and more curiously, two-tone in steel and yellow gold. Military issue watches are hardly ever two-tone – this is marked “Marina Militare Italiana”, or “Italian Navy”, on the case back – which leads to the assumption that this was produced for officers for wear with their dress uniforms. It has a razor-thin case band, sloping back and bezel, and narrow, soldered lugs, which combined with the two-tone metal and size give it a somewhat jarring look. 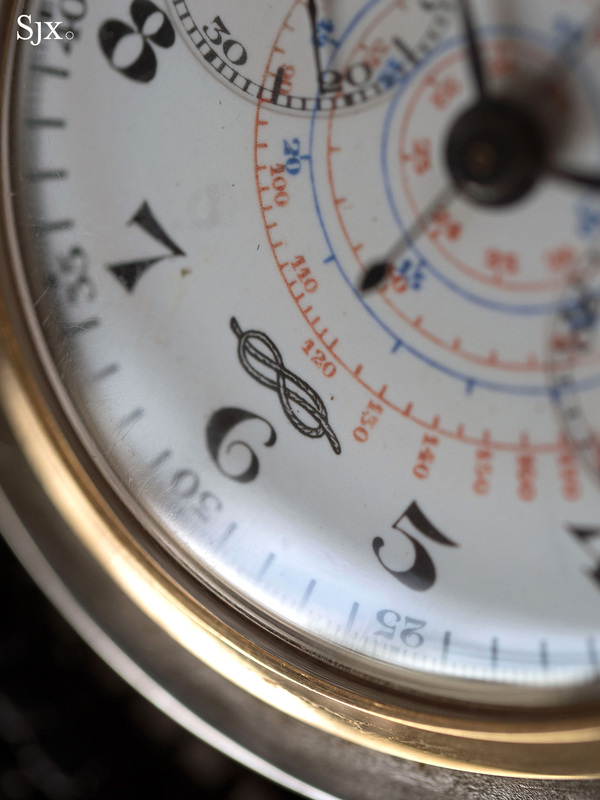 The well kept white enamel dial with red and blue scales is conventional for the time, with the nodo savoia, or “Savoy knot”, at six o’clock being the emblem of the House of Savoy, which provided the last monarchs of Italy. 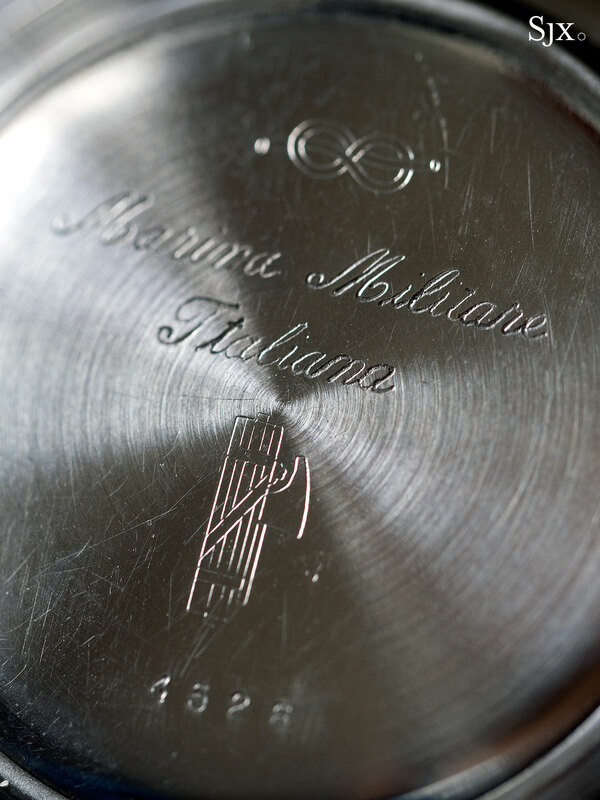 The nodo savoia is also engraved on the case back, along with the emblem of Benito Mussolini’s National Fascist Party, a bundle of wooden rods with an axe blade sticking out. The Zenith Marina Militare is estimated at SFr15,000 to SFr20,000. Something drastically different is lot 200, the Omega Constellation “de Luxe” ref. 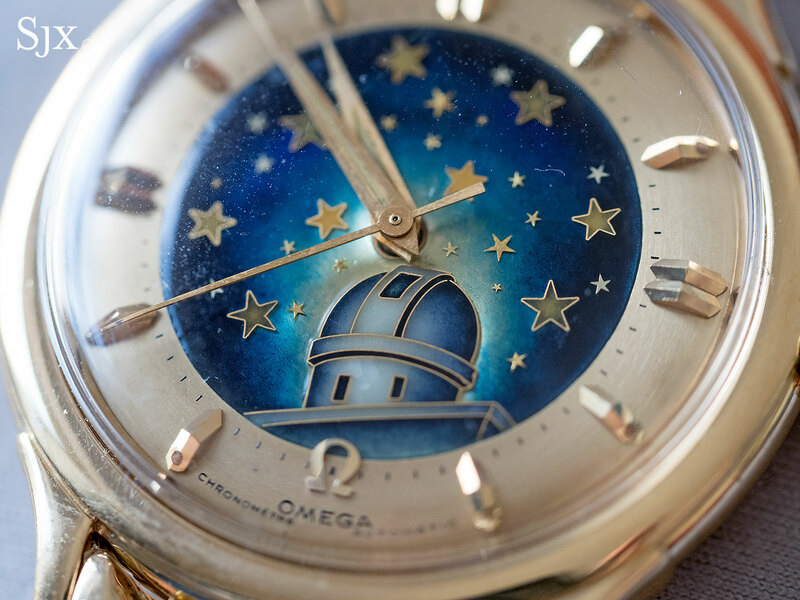 2699 with “observatory” cloisonné enamel dial – the top of the line model from Omega’s top of the line collection during the firm’s heyday in the mid 20th century. 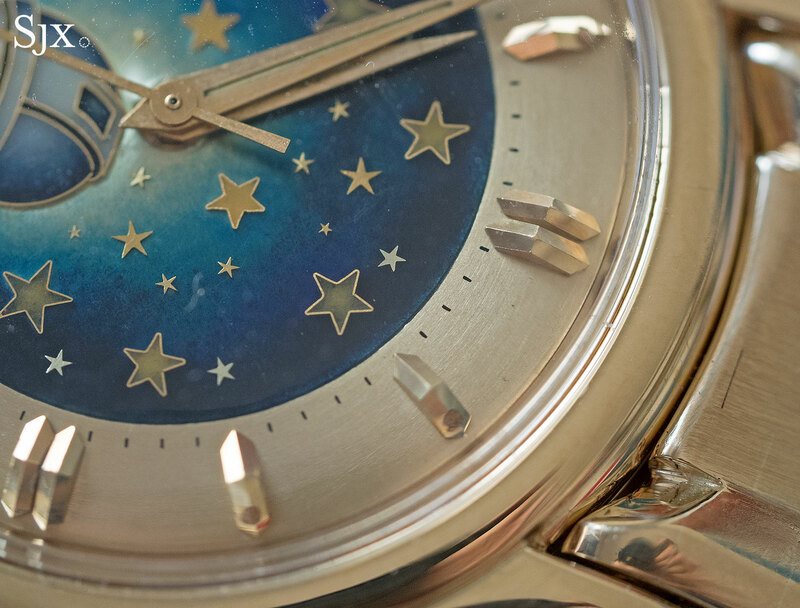 The Constellation “de Luxe” models were distinguished by their gold cases and gold applied markers on the dial (and there was the “Grand Luxe” with the case, dial and bracelet in gold). 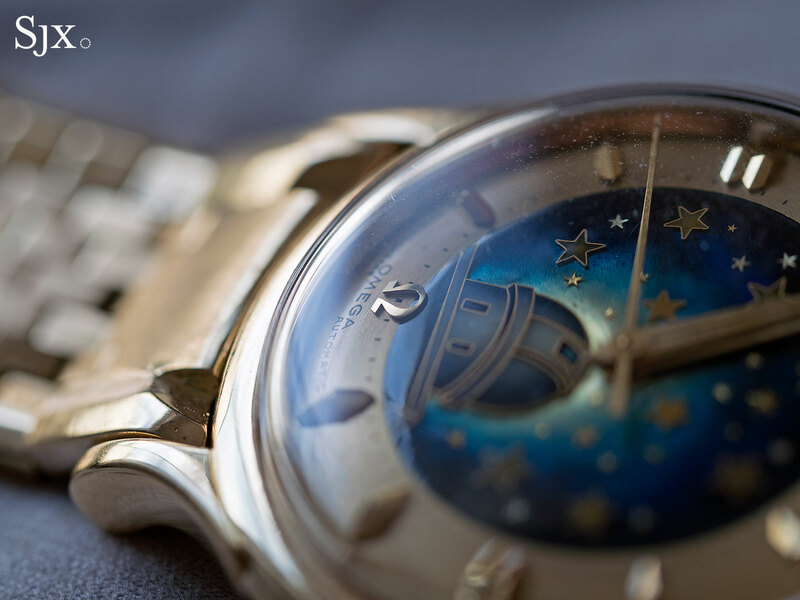 This specimen has a cloisonné enamel dial depicting the Geneva observatory against a starry night sky, one of a small number made in the 1950s for the Middle East. 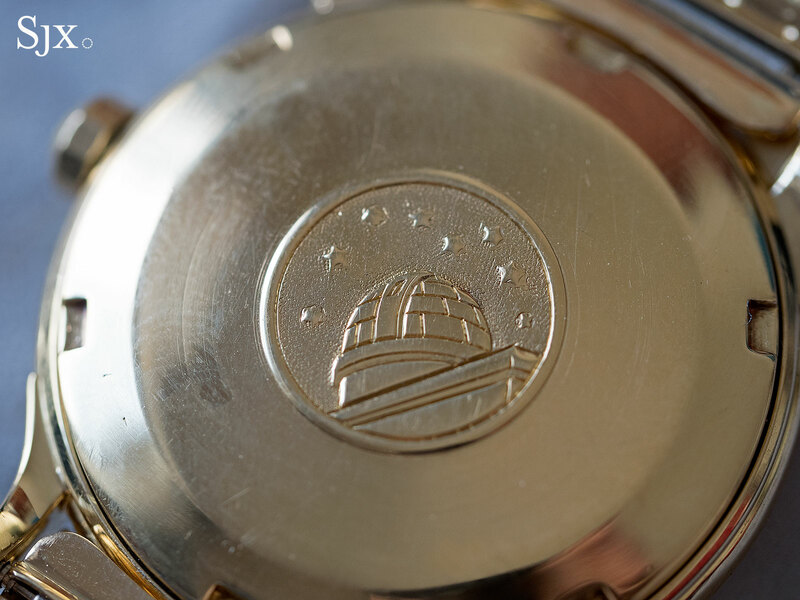 The motif was a reference to Omega’s strong showing year after year at the annual observatory chronometer trials in the decades preceding this wristwatch, explaining the observatory emblem also appearing on the case back of all Constellation watches. The dial was produced by Stern Freres, the Geneva dial maker that was a leading producer of enamel dials during the period. 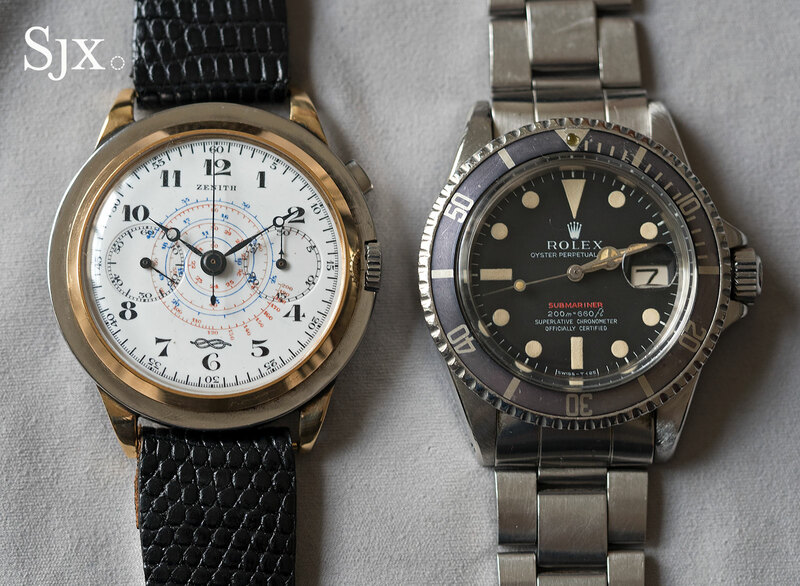 Specifically, the dial was made by Nelly Richard, the noted enameller who was responsible for many such dials at the time, including the Rolex Neptune wristwatch that is being sold at this very same auction. 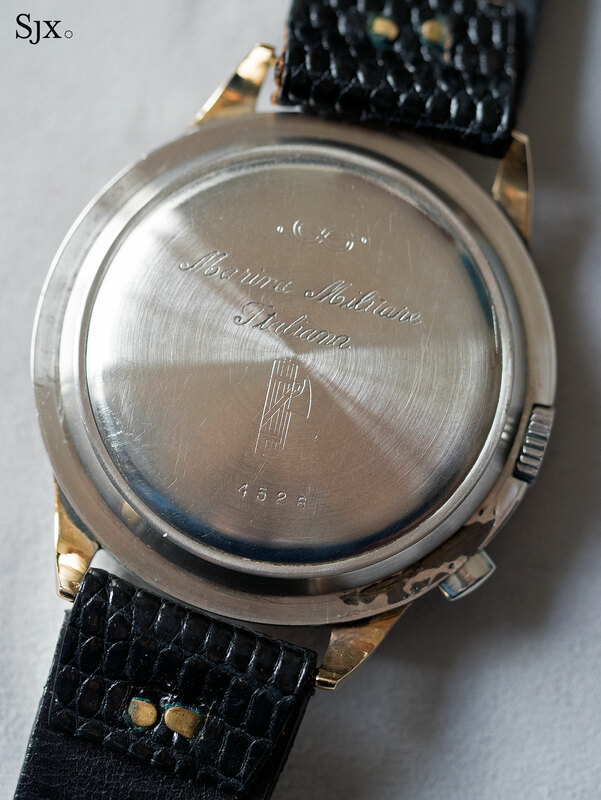 According to the Stern archives, Ms Richard was paid SFr80 for the observatory cloisonné dial, putting it amongst the more expensive dials made then. The watch is accompanied by a gold Omega bracelet, which adds significant value but is not quite as impressive as the “brick” bracelet found on the Constellation “Grand Luxe”. 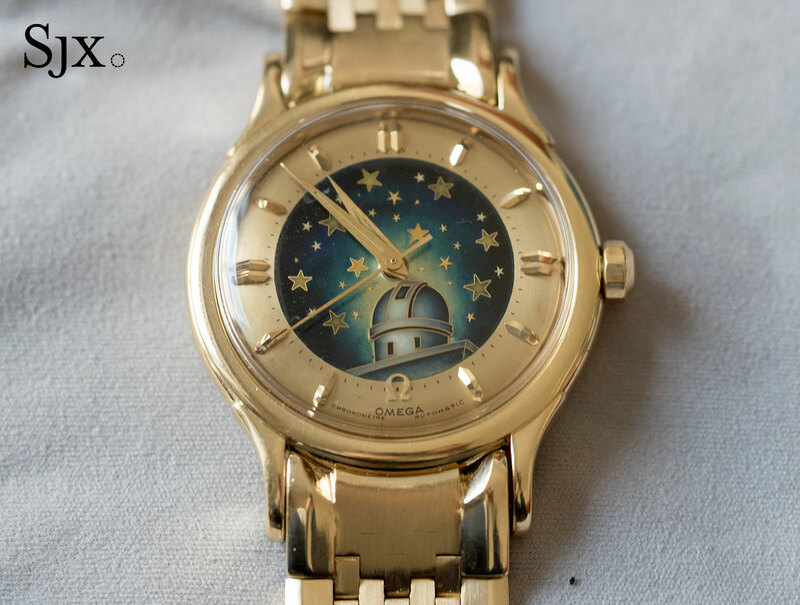 More importantly, this Constellation is in excellent condition, with the engraved observatory logo on the back still well defined and sharply etched. 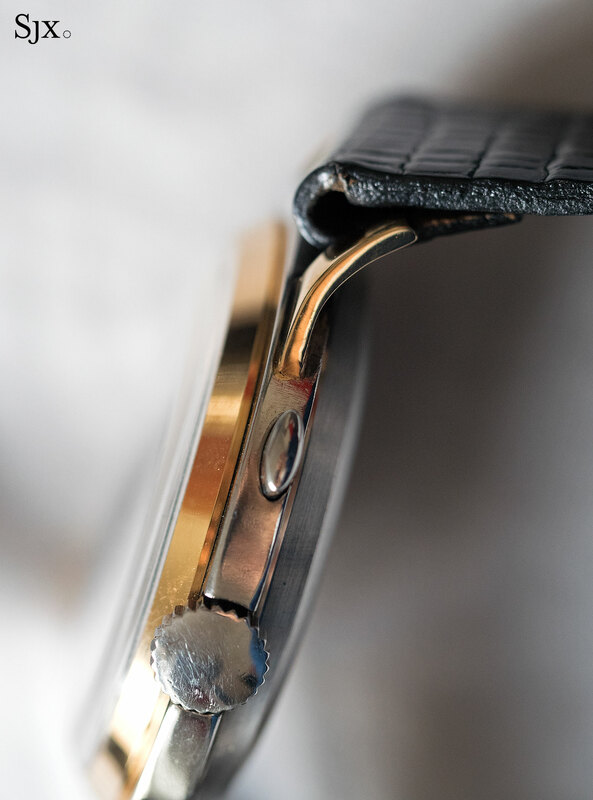 The softness of 18k gold means that the markings on the case back are often worn away over time. The Constellation “de Luxe” is estimated at SFr80,000 to SFr120,000. Less intrinsically special but in a style that’s suited to the current fashion for vintage chronographs is lot 189, an Omega ref. 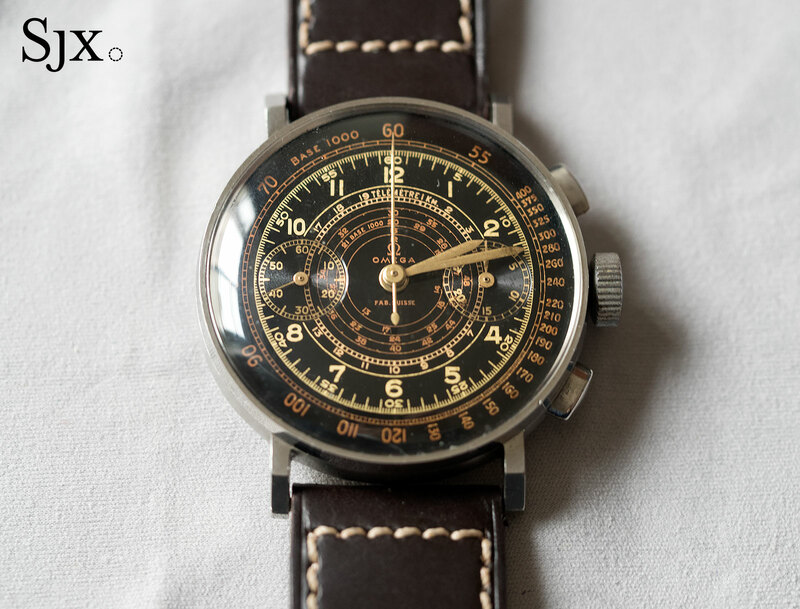 CK 2393 chronograph. Circa 1939, this is a striking wristwatch with a glossy black dial featuring two-tone printing and both tachymetric and telemetric scales. The French language “Télémètre” and “Fab. Suisse” on the dial indicates this was for a Francophone market. The steel case is 37.5mm in diameter, with the added advantage of retaining the well-defined edges on the lugs and bezel. Inside is the Omega calibre 33.3, a hand-wound movement that’s one of the best known from the early 20th century, and also the predecessor to the later Omega calibre 321 and Lemania CH27. The CK 2393 chronograph is estimated at SFr15,000 to SFr20,000. 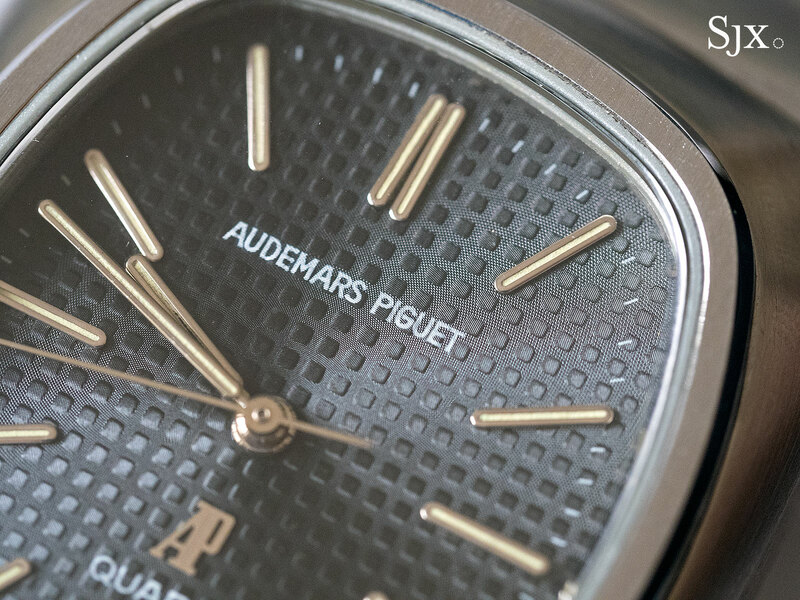 Lot 109 is an Audemars Piguet ref. 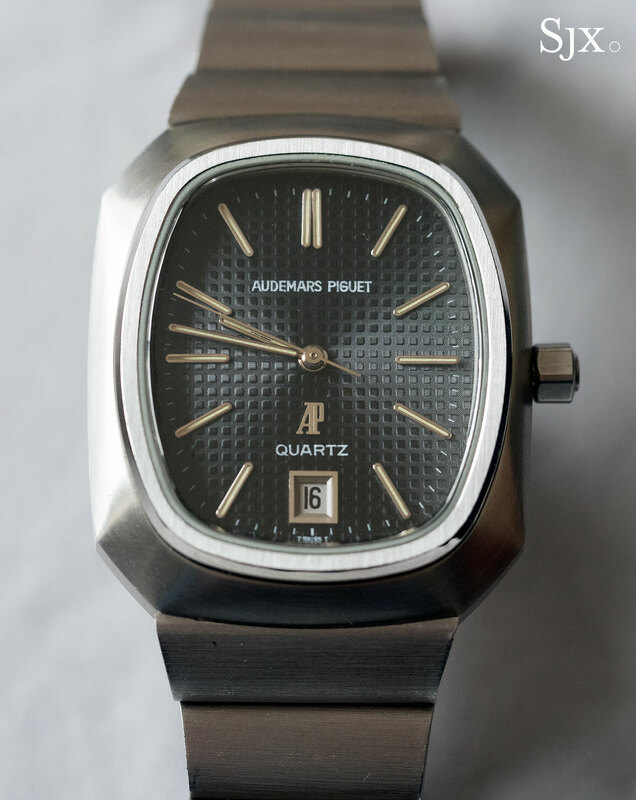 6001, a chunky watch from the 1970s that looks quintessentially 1970s. More historically interesting than it is attractive, the ref. 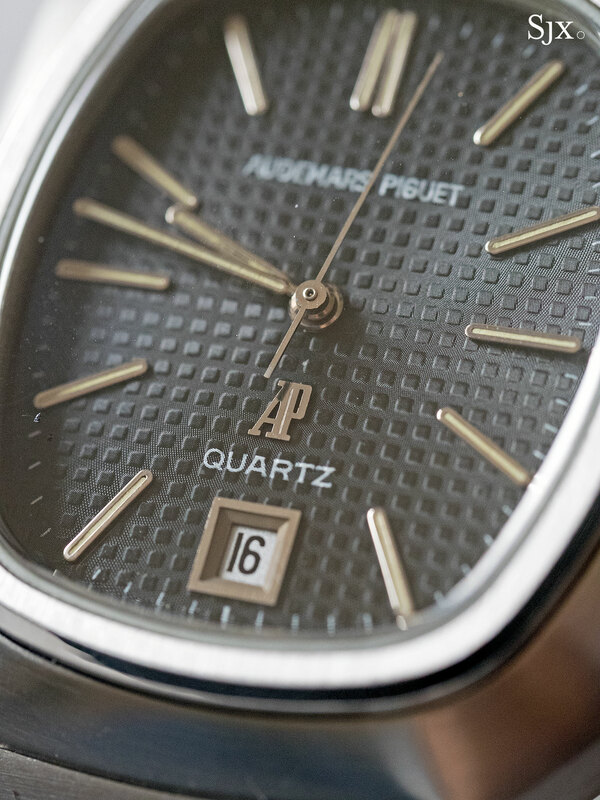 6001 is first ever quartz Audemars Piguet wristwatch. A remarkably advanced and expensive watch in its day, the ref. 6001 is equipped with the calibre 2510, an ultra-precise movement that kept time to one second a month. 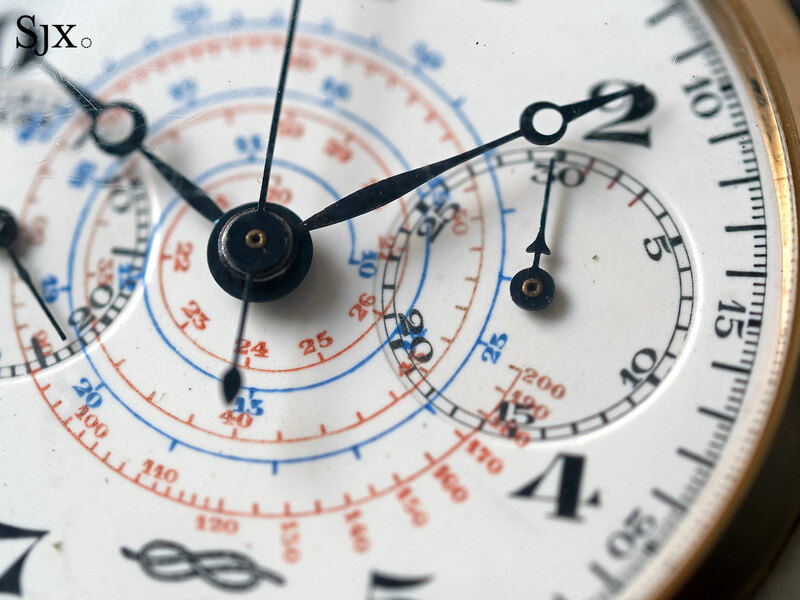 The calibre was actually produced by Omega and identical to that found in the Omega Marine Chronometer. As notable as the technology inside is the dial design, which is evidently inspired by the Royal Oak. It’s a dark blue with tapisserie guilloche as well as baton hands and indices in white gold. Estimated at an affordable SFr5000 to SFr8000, which is likely less than what it cost new in 1974 after adjusting for inflation, this illustrates how technology quickly goes out of date. 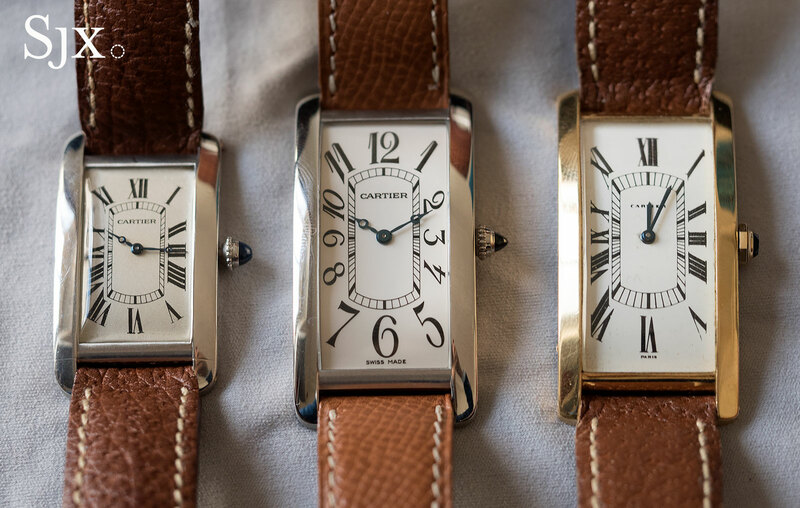 In contrast, the half dozen or so Cartier Tanks in the auction remains as classic now as the rectangular form did decades ago, but are just as accessibly priced. Lots 137 to 144 are all Cartier Tank wristwatches, with the more affordable examples being the modern watches. 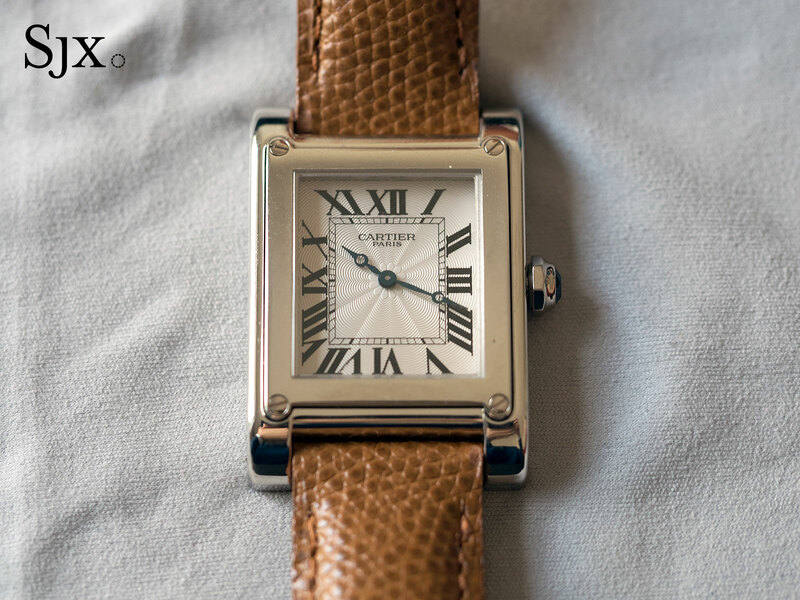 Lot 139 is a Cartier Tank à Guichet, a limited edition for the jeweller’s 150th anniversary in 1997. A faithful remake of a historical Cartier wristwatch, this is a jump hour with a platinum case. 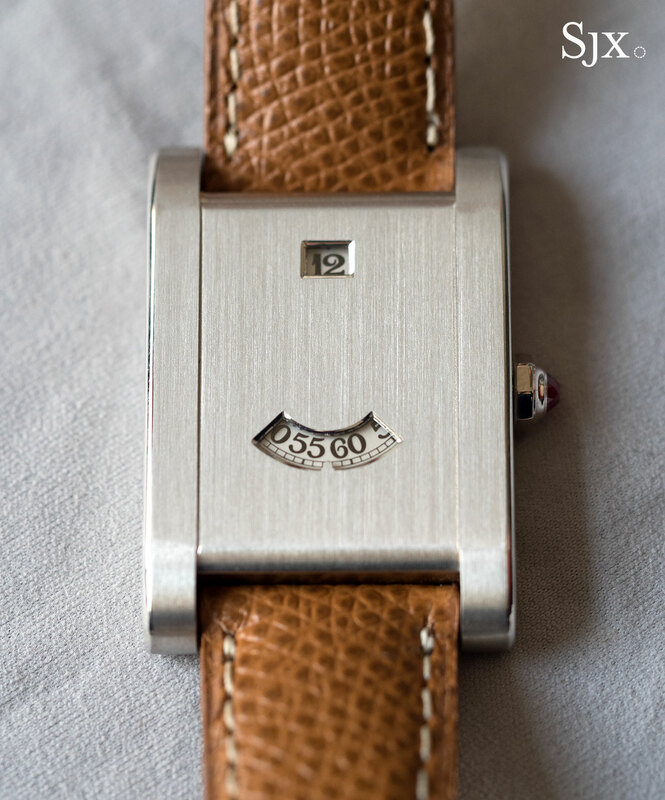 The case is 25.5mm wide and 37mm long, which isn’t large but substantial enough not to feel small, as is often the case with rectangular watches. It carries an estimate of SFr12,000 to SFr18,000. Also platinum but slightly larger is lot 141, the Cartier Tank à Vis ref. 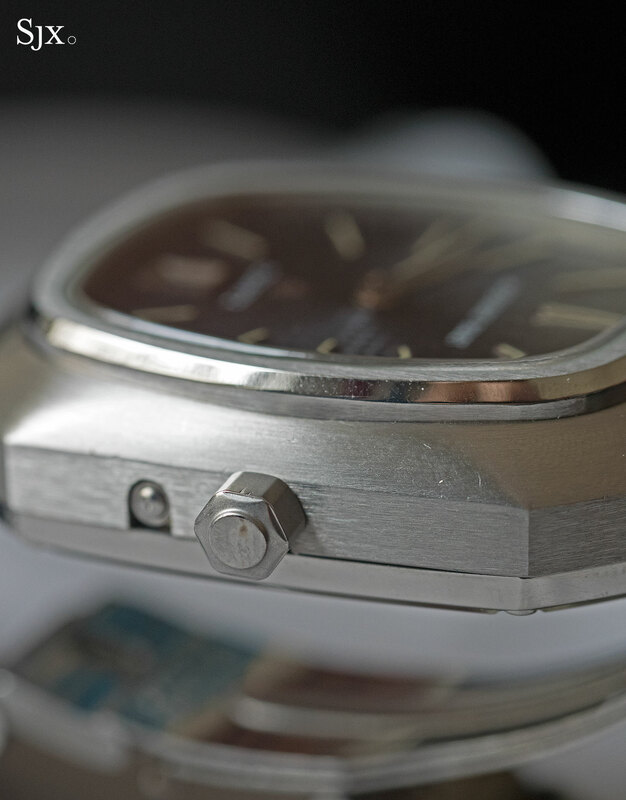 2485 E. Translating as “screwed Tank”, the model gets it name from the four screws on the corners of the bezel. While the Tank à Vis was part of the regular line-up in the early 2000s, this specific example is a special order with blued steel Breguet hands, replacing the sword hands that are usually found on the watch. This has an estimate of SFr8000 to SFr12,000. Highlights from the sale will be in New York from April 21 to 24 at 450 Park Avenue, with the pre-sale exhibition taking place in Geneva from May 11 to 14 at La Reserve hotel. The Geneva Watch Auction: Five takes place on May 13 and 14, 2017 at La Reserve. The full catalogue and more information is available from Phillips. 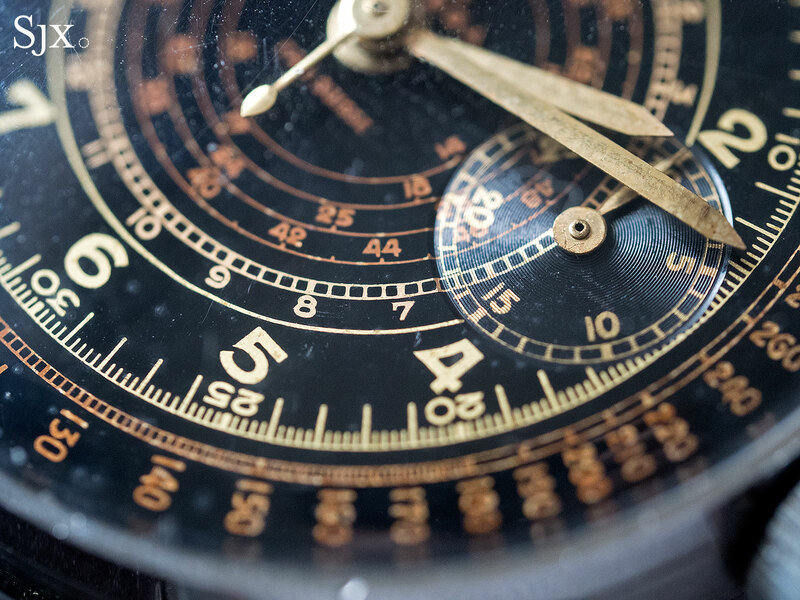 The auctioneer's upcoming Geneva sale features historically important watches, including a trio of Patek Philippe 1518s, as well as timepieces with intriguing backstories.